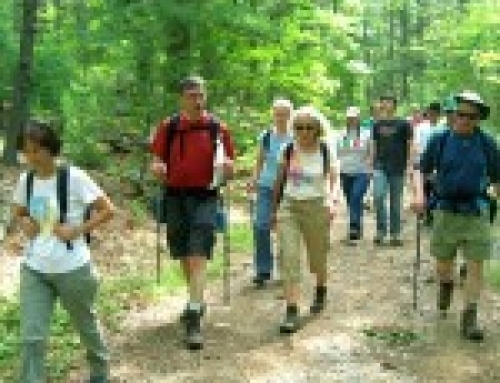 I’ve taken groups of beginners on a “My First Hike” loop at the Blue Hills Reservation in Milton, MA. It’s great for first-timers or not-in-a-long-timers. But now I need a next hike for those folks who’ve done the first hike. 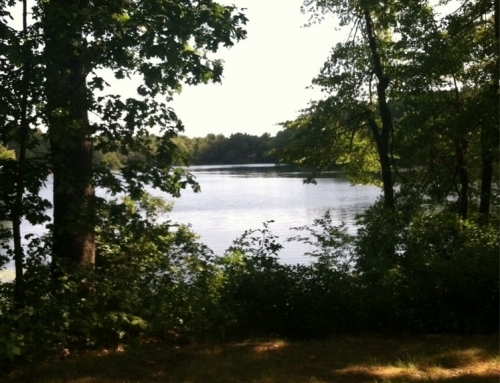 Maybe a loop over to Buck Hill and back to Houghton’s Pond will be just what’s needed. My faithful hiking companion and grand-dog, Juniper the Bichon Frisee, and I start out on a perfect “Colorado” day—hot sun, clean, dry air and temperature in the low 60s. We don’t get many of these in New England, so one snatches them up like the gifts they are. We begin the same way as the first hike. I figure the gentle warm-up around Houghton’s Pond and a touch of climbing up to the top of Tucker Hill is good for the beginner body, and the familiarity for those who’ve done it before will be good for the confidence level. And who can argue with another view of Great Blue Hill from the top of Tucker? Check out the morning section of My First AMC Hike several posts back for pictures and description. 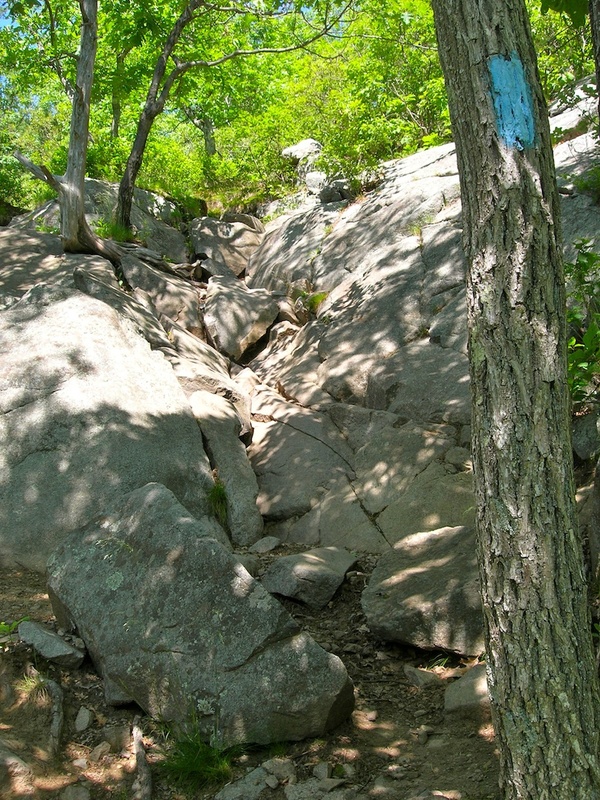 From the top of Tucker Hill, we follow the blue blazes of the Skyline Trail east. 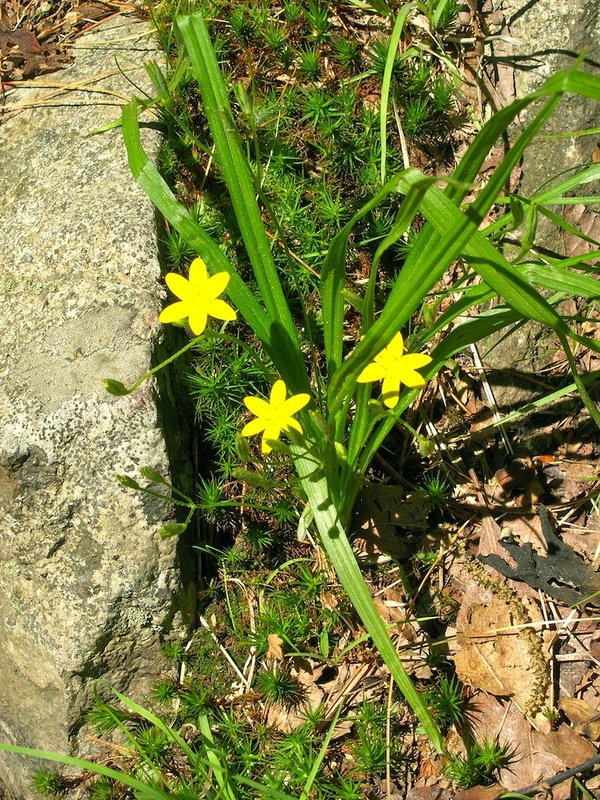 The sun warms our faces and brings out little plant companions like this little yellow flower that I couldn’t identify. Does anyone out there know it? And here’s one of my favorites, Toad Flax. I love the crazy name and their spindly look with the odd bluish purple flower. They’re ugly and delicate at once. Here they are set off by the map lichen behind them on the rock. Not to be outdone by the plant world, birds caw and sing, and this handsome butterfly stops by for a visit. Anybody know what kind of butterfly s/he is? From here the trail starts to look like we’re in New Hampshire. We stare down from the top of rock piles that, in fact, are the trail that takes us down the side of Tucker. Little Tucker Hill, which seemed so friendly with its bit of rocky ascent on the western side, gets crankier and more demanding on its eastern slope, as if to say, Hey, I’m no pushover! Think boulders, smaller rocks and dusty loose pebbles, or scree. It’s just like the White Mountains, except it only lasts for a few minutes rather than several hours. Or days. Soon the trail gentles, and greens considerably. 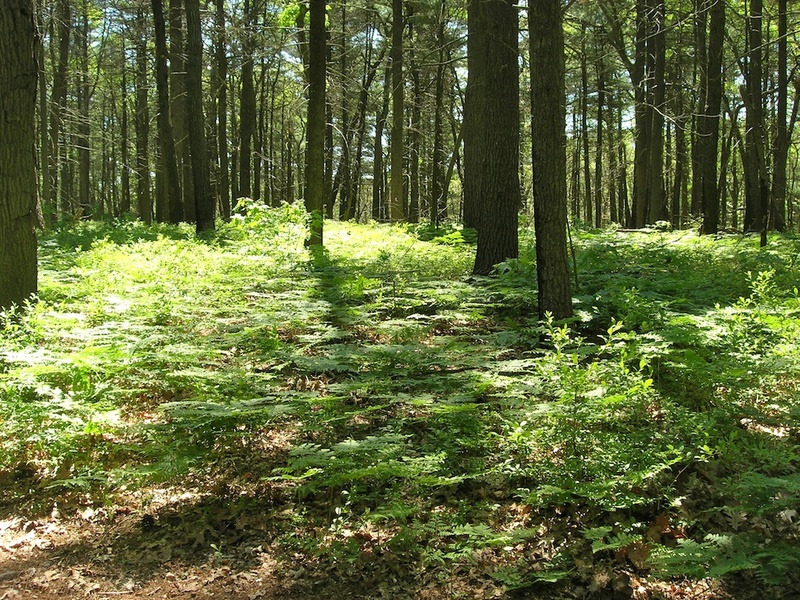 We stroll through the forest, then up a gradual embankment that turns out to be the side of North Boyce Hill. The top of this small hill is like an underwater sea of greenery with trunks of giant kelp floating upward. We decide this is a beautiful spot for a snack, and a bowlful of water for the pooch. 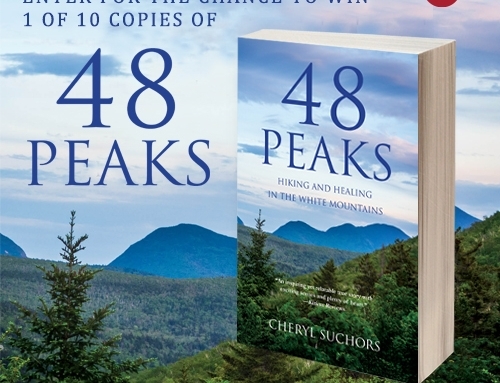 Our trail leaves N. Boyce gradually and climbs to the vast open meadow of Buck Hill’s shoulders and summit, great grazing for a pair of hawks circling by close enough to make me keep a sharp eye on my not-quite-13-pound hiking companion. 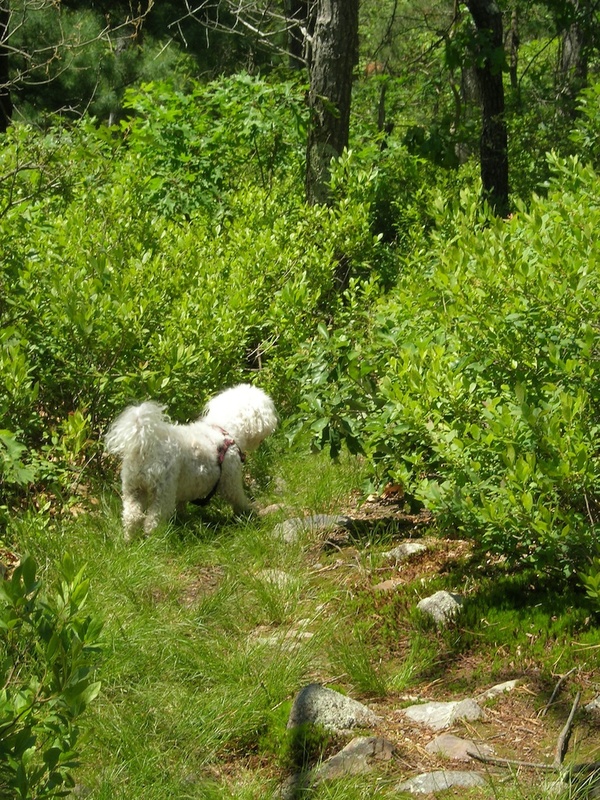 Her Bichon Frisee friend, Sadie, was swooped by a red-tail at no less a civilized place than Fresh Pond in Cambridge! 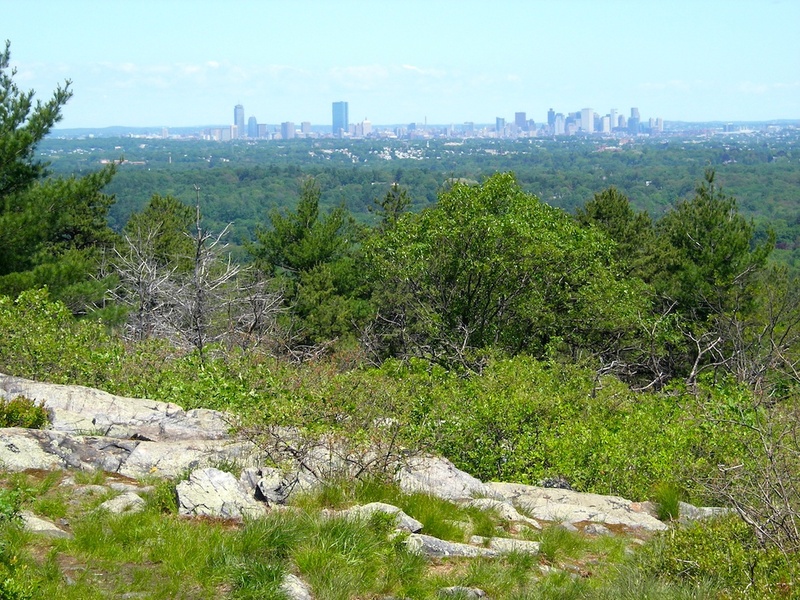 With no hawk mishap, we arrive shortly at a view of Boston, roughly five miles distant, from atop Buck’s. The city skyline is so clear it looks like a cardboard cutout that I could fold up and stick in my backpack. Now I understand the naming of the trail. I’m impressed, both with my city and with the wisdom of those who, in 1893, preserved the accessible and varied Blue Hills for we city-dwellers. After admiring the view long enough to develop a sweat from the bright sun, we clamber down from Buck’s. 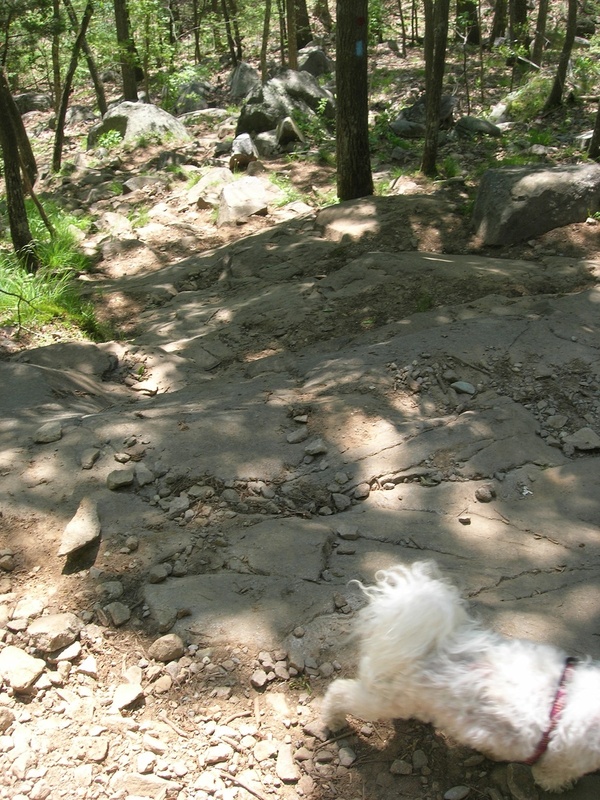 Again, the trails are rocky and somewhat rough, but not for long. We get just enough of a work out for the knees and hamstrings to feel like we’ve earned the pleasant shady green stretches in between the harder bits. Meandering back through the forest to Houghton’s Pond, Juniper goes for a dip to cool off before we head for home, refreshed by the morning’s ramble. 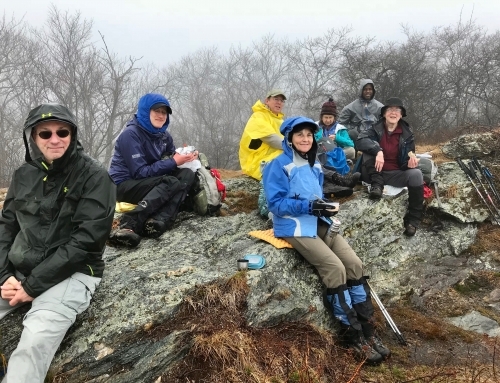 It’s a good hike, but a little more than I wanted for Hike Number Two for beginner groups. Oh well. This just means another scouting expedition for Junie and Grandma in the Blue Hills!